I’ve been kind of behind on the daily “what we’ve been up to” blogs, but when I finally get the chance to back-blog them, you’ll see why! Until then, here is my latest fixation. Of course, I didn’t think of it until AFTER we went to three thrift stores, but oh well. I guess another excuse to hit the stores again! 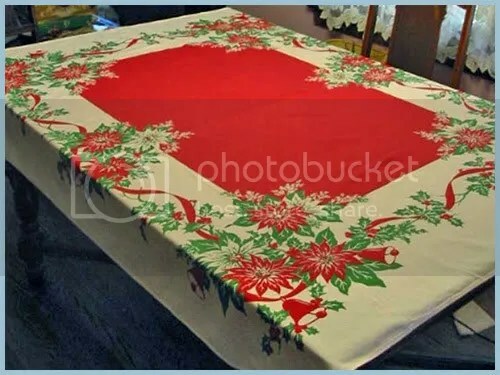 My latest vintage obsession is finding the perfect vintage Christmas tablecloths for the house. 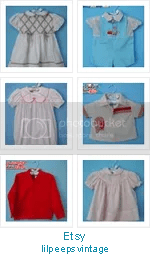 Now, this is a good obsession, because it is easily quelled; two clothes and I’m done. I didn’t think of it until I was looking at my vintage “fall” (read: orange, yellow, and green themed) tablecloth, and thinking how I was going to have to pack it away soon. LOVE LOVE LOVE the vintage table cloths! 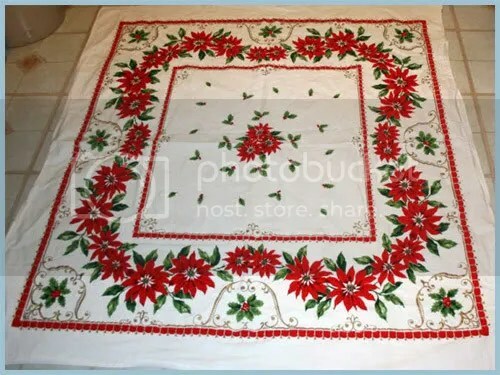 Grandma had table cloths like that! Makes the room so festive! Indeed! I was able to find one while out thrifting. Now I just need one for the dining room!